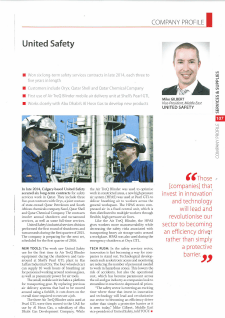 United Safety’s Mike Gilbert, Vice-President for the Middle East is featured in The Oil and Gas Year (TOGY), Qatar, 2015. This article discusses United Safety’s success, securing six long-term contracts for its safety services in Qatar. United Safety will be supporting Oryx GTL, Qatar Shell and Qatar Chemical Company for their annual shutdown and turnaround services. The company will also be providing a number of full-time services for these companies. United Safety has been bringing innovative solutions to the Oil and Gas industry in the Middle East. Our innovation, the Air TreQ™ Blinder was used for the first time on Shell’s Pearl GTL plant, which resulted in significant benefits in work execution time and safety. In conjunction with the Air TreQ™ Blinder, a new high-pressure air system (HPAS) was used to optimize work performance. A combination of the use of our technologies provided workers with more maneuverability while decreasing safety risks associated with transporting heavy air storage units around the site. The article ends by discussing the importance of innovation in the safety services sector. Gilbert talks about the significance of investing in innovation and technology which revolutionizes safety to become an efficiency driver, rather than being considered a hindrance to the overall process.